The CPSC is advising parents and caregivers to be cautious when using infant slings for babies younger than four months of age. In researching incident reports from the past 20 years, CPSC identified and is investigating at least 14 deaths associated with sling-style infant carriers, including three in 2009. Twelve of the deaths involved babies younger than four months of age. Any thoughts on this? I didn't use slings or carriers with my son but I did with my daughter. I used a regular front carrier type, like this but a different brand, and it was pretty awful to try and figure out. When she was smaller I used a Hugamonkey sling. (*Update - With future children, I've since went on to try out many other types of carriers: mei-tais, Moby wraps, soft structured carriers, and more. See more recent posts.) Slings/carriers are very convenient and help you to maintain closeness with your baby when you might not always have the hands for it such as when you're walking, out and about, doing chores, and when you're without a stroller, etc. They also help baby to feel safe and snuggly like they did in the womb. I hope this warning doesn't make people fear slings or not want to use them because when used correctly and safely, they're absolutely fine! I believe certain "slings" are bad. Such as the infanto ones that are just a snuggly death trap. We tried one with our oldest and I hated it. I could never tell if he was secured enough or getting enough air. I threw it out after the first and only use. I personally love my Mei Tai and my Moby Wrap. Both have been life savers with my boys especially my 2nd who was just a need mama type of baby. I couldn't get through days of cleaning without my Mei Tai! That is true. The one carrier I tried with Zeke when he was little was AWFUL. It was all kinds of straps and buttons and flaps - I couldn't figure it out at all and it didn't seem like it had any head support. I think the problems is with the bag type- the kind you get from Target or Babies R Us that sit low and the baby's chin is pressed up to it's chest. The news reports shouldn't have lumped all slings together. Thanks for the comment Clint! I really like my Hugamonkey sling and I think it's very safe. I need to get some more pictures of me with it! Very true. I'm afraid it will turn people away because they'll think ALL slings are bad. I saw this too on the news. I'll have to admit, being a person who worries about EVERYTHING, I gave my homemade sling to my daughter for her babydolls. I am a big-time worrier too! I personally was not a fan of pouch like slings because I could never get the baby to fit correctly. 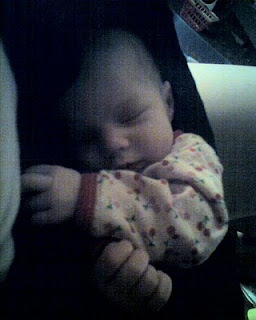 But I LOVE ring slings where the baby sits upright against your chest. Very snuggly and safe. I do not like the warning that was put out at all because I think they clumped all baby slings into was category when most are really wonderful to use. Babywearing is so good for momma and baby! The need to promote safe ways to use slings, not ban them all. Agreed! I had several friends contact me because they knew I was a baby wearer and said "Oh those are BAD - they recalled them!" I'm like noooooo, not ALL of them are bad! Using things by following the safety directions and buying the baby slings of reputable company's will always stand out.